It boasts some of the Biggest Thrills that Walt Disney World has to offer, and it’s currently under a lot of construction, but we’re going to tell you why you shouldn’t just dismiss it. This park might still be Disney’s best spot to take your little ones! 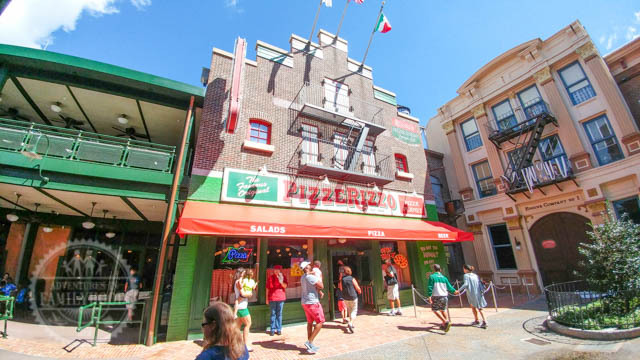 Here’s our 10 Best Things to Do for kids at Disney’s Hollywood Studios! I know we’re all kids at heart, especially while at Disney, but for this list, we’re going to concentrate on the little ones. So nearly everything we mention here is going to be accessible to all kids ages. That means no height requirements. Once Toy Story Land opens this summer, we’ll update the list. 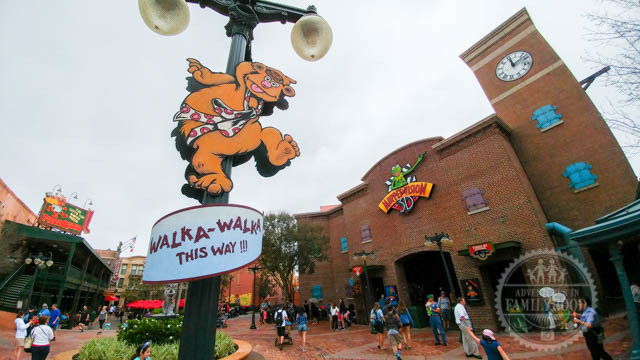 Height requirements may keep us from adding the two new Toy Story themed rides, but the land itself may become one of the top reasons to take the kids here. 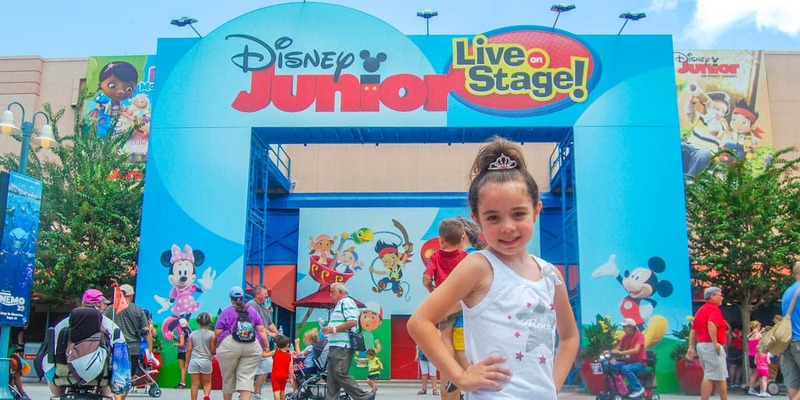 Kids love Disney Junior, and Disney’s Hollywood Studios is the only park in Walt Disney World that features characters from Disney Jr. shows. 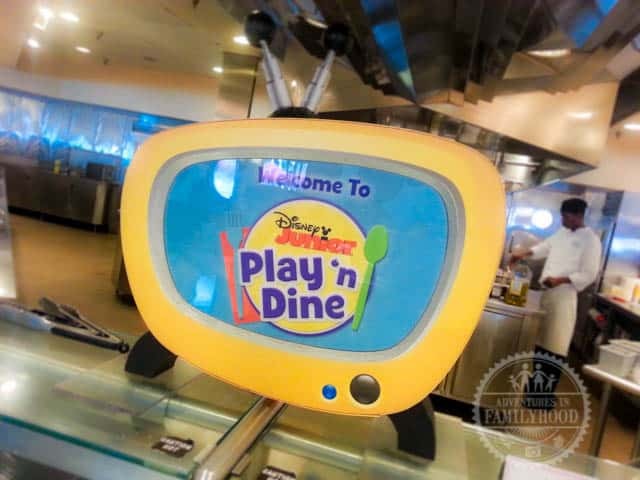 We wrote a detailed review of the Play N Dine character breakfast here. It became one of our favorite character meals on property because of the great character interaction. It’s a “must do” for fans of Doc McStuffins, Sofia the First, Jake and the Neverland Pirates, or Handy Manny. 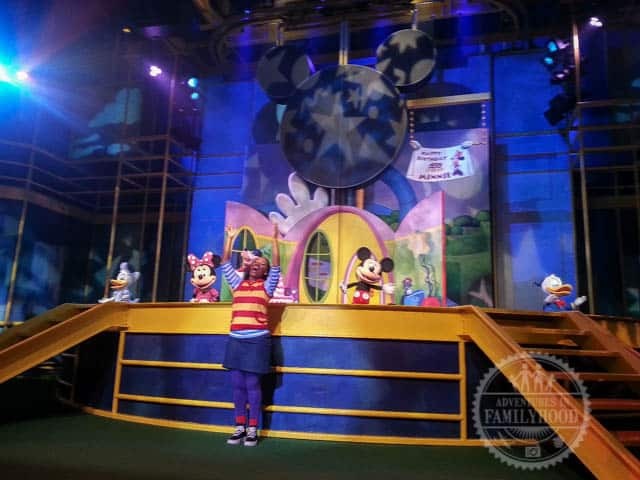 Another “must do” for Disney Junior fans is Disney Junior Live on Stage. It can be a little uncomfortable for the adults to sit on the floor, but it’s worth it to see the kids stand up and dance throughout the show as puppets from Mickey Mouse Clubhouse, Doc McStuffins, Sofia the First, and Jake and the Neverland Pirates entertain! Keep an eye out for bubbles and gold doubloons! It may take some time for your little one to warm up to larger than life characters, especially on a first visit. But once your child gets over their hesitance, you may find you have trouble pulling them away from their favorites. Disney’s Hollywood Studios is great for character meets because there are many here you can’t meet at the other parks. This is also usually the place to see stars of the latest film release by Disney. Last year, we met Moana at the back of the “Walt Disney Presents” attraction (formerly called “Walt Disney: One Man’s Dream”). On top of these, you also get Sorcerer Mickey and classic Disney characters like Minnie, Goofy, Donald, Daisy, Pluto, and Chip & Dale. 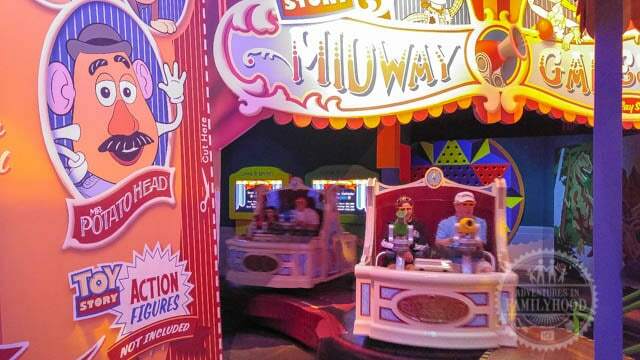 Toy Story Midway Mania has been the centerpiece of Pixar Place and will be a big part of Toy Story Land when the land is opened this summer. This is the most popular attraction for the whole family in the park (and possibly all of Walt Disney World). Even if your kids are too small to do it on their own, they can have a blast helping mom and dad try to score high on the carnival-style 3D games. It’s one of those attractions you just want to do over and over again, but with the wait times, you’re lucky to ride on it once. Be sure to get FastPass+ for this one! I’m certain that Slinky Dog Dash will have a height requirement when it opens. I don’t know if the same will be true for the Alien Swirling Saucers ride. Once only available during Star Wars Weekends, the Jedi Training: Trials of the Temple is now open all year round, training a whole new generation in the ways of the force! Space is very limited and fills up quickly each morning. So be sure to get there early to sign up your young padawans for their chance to battle the sinister Darth Vader or another Star Wars villain! This is the only experience on our list with an age requirement. The Jedi Training Academy is officially only open to children ages 4-12. They don’t ask for a birth certificate, but they do need to speak to your child when you register to make sure they can answer questions and follow directions. I’m sure a few advanced 3-year-olds and young-looking thirteen-year-olds have wielded lightsabers at Disney’s Hollywood Studios. Their training takes place for all to see, with a special section reserved for parents. 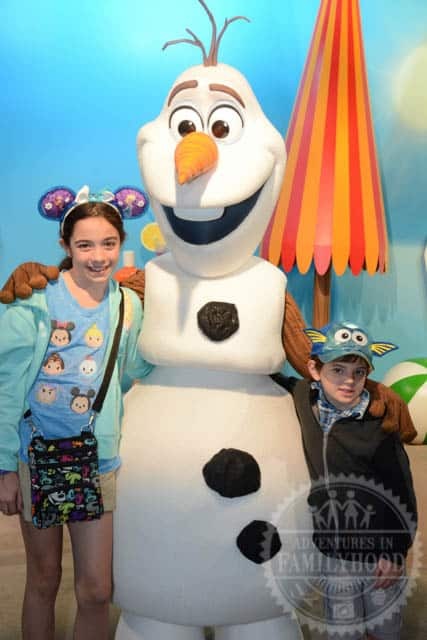 PhotoPass photographers are on hand to capture these magical moments, and each child is presented with a certificate upon completion of their training. Shows are subject to cancellation due to inclement weather. I advise checking the hourly forecast when signing up. Who doesn’t love the Muppets? Until the new movies came out, our kids only knew the muppets from Walt Disney World, but they still enjoyed what I consider to be the best of all the 3D movies that Disney offers. There’s just something I love when I see not just my kids, but all the kids in the theater reaching up and trying to touch the 3D objects. The wacky effects and sight gags will have your laughing the whole time. There’s even some classic Muppet humor for the adults too! We stopped by here to eat last year and were pleasantly surprised. 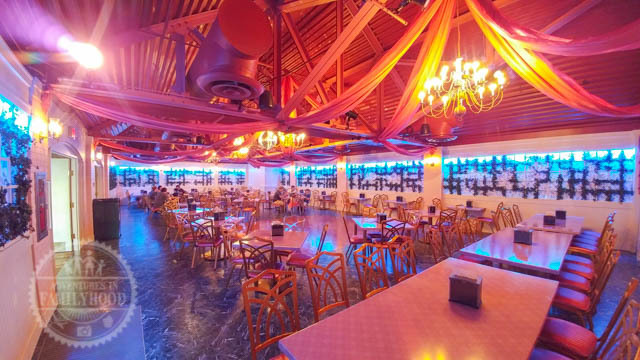 The food is edible and the atmosphere is cute with lots of fun muppets touches. But, you MUST eat upstairs in the banquet hall! That’s where the fun is at! On the second floor is a room set up for a wedding reception. Have a seat and enjoy your food while listening to dance hits you’d be likely to hear at any wedding. Complete with disco ball and DJ lighting, this room was fun to stumble upon. The only way it could have been better is if there had been Electric Mayhem cover versions of the songs. Despite many parents’ secret wishes, “Frozen” is still quite popular. 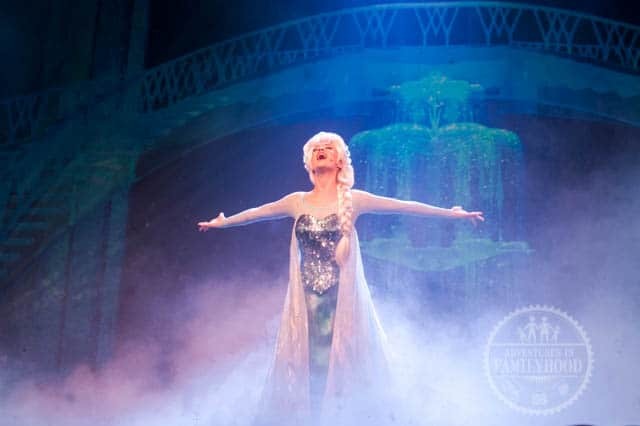 While the Frozen Ever After ride can be found in Epcot, Disney’s Hollywood Studios has “For the First Time in Forever: A Frozen Sing-Along Celebration”. It’s like seeing only the song parts of the movie, with live actors filling in the gaps. It’s not as painful as it sounds. I actually enjoyed it, and more importantly, so did the kids. 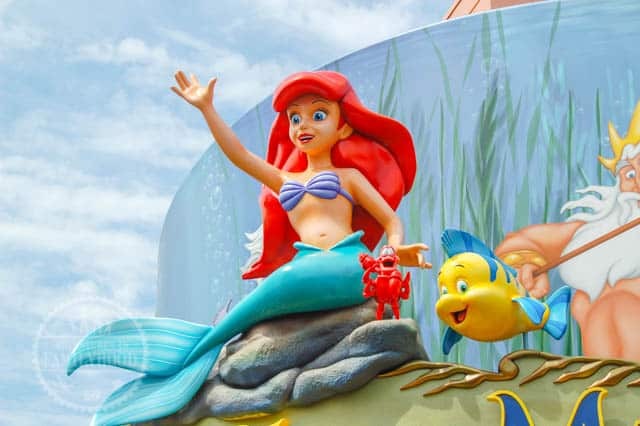 What I love about this version of the Little Mermaid is how it combines the live Ariel with the very colorful puppet sea creatures, the animated background, and the little “4D” touches that make you feel more a part of the story. Kids love it because it is so colorful and they know the story and the music. It’s long enough to offer a good escape from the Florida heat and humidity, but short enough for the kids to sit through it. With all the great music and characters of the film, this broadway-style stage show is a delight to watch. The theater is outdoors, so there’s no air conditioning, only a canopy to provide shade. 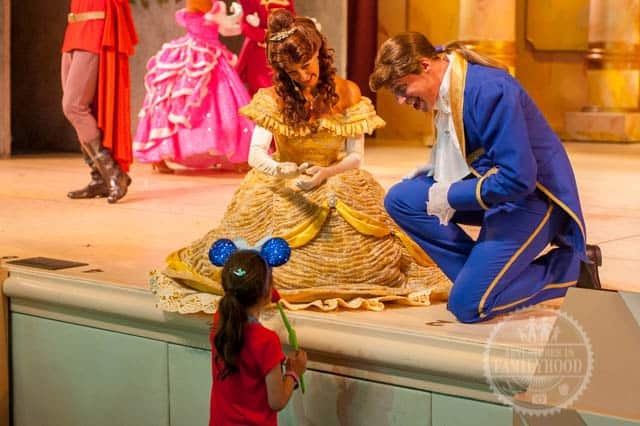 But once the show starts you’ll forget all about the heat and be swept up in the magic of Beauty and the Beast! It’s something for the whole family to enjoy! Arrive early and your child might be picked to play a special part in the show. It’s one of those special “pixie dust” experiences Disney is famous for. Disney’s Hollywood Studios has not one, but two nighttime spectaculars on most days. Provided the kids are not tuckered out and asleep, it’s a great way to end the night. 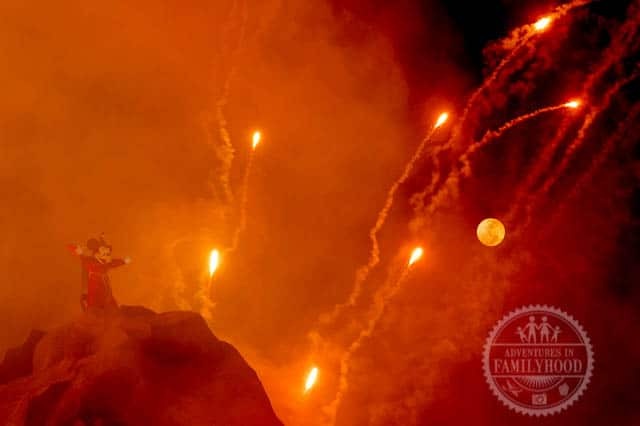 Disney’s Hollywood Studios’ nighttime spectacular Fantasmic! is a must-see. The wait can be tough to endure, since you have to arrive early to get good seats. But if you can handle the wait (bring snacks, light-up toys to keep kids occupied), you’re rewarded with a great show combining live-action with pyrotechnics and water-projections! The grand finale is awesome!! This relatively new display combines music, projections, and fireworks with the story of Star Wars to create a thrilling spectacle. While I would normally advise possibly watching the fireworks from a distance, the projections need to be seen up close. If the kids are bothered by loud noises, consider bringing noise-canceling headphones. 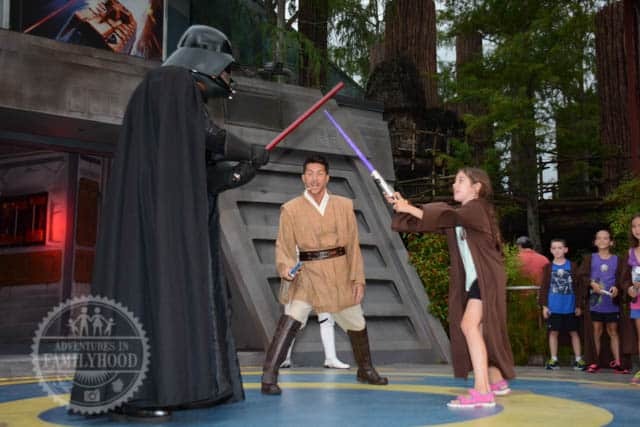 So there you have it, our 10 Best Things for Kids at Disney’s Hollywood Studios… for now! This may change once Toy Story Land and Star Wars: Galaxy’s Edge are open. I also have a feeling the new attraction “Mickey and Minnie’s Runaway Railway” is going to require a spot on this list, too. In the meantime, did we miss anything? Let us know in the comments!! Thanks! Muppets 3D is still one of my favorite shows and the meet and greets are fantastic! I can't wait to take Lexi to see all of the Disney Junior activities!! She loves it all. What a great list! With the exception of the Disney Jr. stuff, we love all these things (never really got into that since we don't have tv).